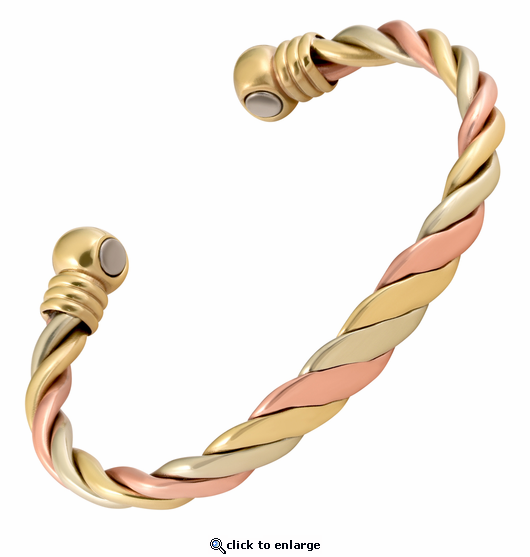 This is a wonderfully crafted tri color copper magnetic therapy bracelet. This therapy bracelet is made with three solid metals that are all made from copper and has no color plating. It is made with with pure copper, brass(about 85% copper), and German silver(about 60% copper) and it has 2 powerful 3000 gauss rare earth bio north facing magnets. It also has stainless steel magnet caps for added durability. This stylish magnetic bracelet is made nickel free and is about 1/3" wide. This was a nice surprise. The bracelet is well made, good quality and and the three colors are distinct and shiny. I ordered a small size, the size chart has a link on their website. I am a female. The small size is adjustable without changing the shape of the bracelet. I am happy with this bracelet. As far as seeing results, its too soon, but I always believed copper helps the body tunes even if the contact is only for few minutes a day. This is my second Magnet/ Copper bracelet. I have worn one or two of them every night for a couple of years, and as a result, my wrist joint arthritis has lessened considerably. Thanks so much! I came home tired and achy after a harder than usual week. Put my new bracelet on this morning. It fit great and is very pretty. But it was not long before I realized my shoulder, which has been hurting for months now, had stopped hurting. I also had a lot of energy all day, and was surprised at how great I felt Ive heard about the magical quality of certain metals and magnets. Maybe its just coincidence, but in case it isnt, Im planning to get another bracelet. The price is more than affordable. This is a great product! I got mine on Sept 1, 2017 on eBay. I ordered the wrong size and Bob was very nice to help me out. I didnt want to simply have a boring solid copper on my wrist, this is very colorful and I have had lots of compliments. I wear it on my R hand. I have had several elbow surgeries and I do not have full range of motion. I am not in any pain. If you have any questions before you buy, I only heard about copper for pain and I was not really positive and Bob did not do a hard sale, he shared the difference in the products that I was looking at. They went out of their way to make sure I was happy!!! I like my bracelet and it works. My bracelet is performing as I expected! My arm feels great and I can do my daily workouts and lifts without pain. It is beautiful and I wear it daily . I ordered my bracelet and I got my confirmation of the order. I immediately realized I may have ordered the wrong size. I emailed your site to explain my problem and my wrist size. I was on vacation on the west coast and thought your office was closed. To my surprise, Bob sent me a reply and assured me my order would be changed to the correct size. I received my bracelet today. The size is perfect and I am so impressed with the beauty and quality of it. This is jewelry as opposed to my old copper wrist band! I can wear it with any outfit! Your site has been bookmarked on my ipad for referral to my friends. Ecxelent quality,look like and confort.Help me to reduce pain muscular arm,shouldel and back. Very nice look and it does adjust to fit my wrist when I wear them I use them together I like the wider look. This bracelet is fashionable and effective. it took a week to get adjusted. my wrists are very small but I was able to squeeze it tight enough to fit. I gave it 4 stars for fashion and effectiveness. would definitely buy another product from this website and company. i have been wearing this bracelet for a while now and i love it. I love it! The triple twist is perfectly crafted and very attractive. I am right handed and wear it on my left arm. I has a long lasting shine and has not tarnished much it all. It is made well and has some weight to it. I am pleased. My husband and I have worn your magnetic bracelets for many years. I just needed a replacement for one that was looking old and I liked the tri-color one for dressier situations. We wear our bracelets continually. We are in our early 70s and are for the most part free of any pain, which I believe we can credit the bracelets for. Thank you for asking. Like the products a great deal - noticed some variety on your website as well as great pricing;even if the magnet aspect of it wasn't helpful (but it is), their really lovely; I'll be back for more in the future. I have been wearing this bracelet for a little over a week, I have fibromyalgia and have been having lots of pain in my wrist. I do type all day 8hrs at work, so far, I am very pleased with the bracelet, I have been a lot more comfortable and painless since I have been wearing it. I also like the way it looks its really pretty.